This was my second time reading A Court of Thorns and Roses. And what an epic adventure of magic, love, torture and darkness. Sarah J. Maas has delivered a unique retelling of Beauty and the Beast that stretches far past the classic tale. Feyre has taken to venturing further and further into the forest, closer to the wall that separates the faeries and their magic from the land of the humans. But when Feyre takes the life of a fae she has to pay the price. Having to leave her father, her sisters and the life she has known behind, Feyre is taken beyond the wall and into a world where nothing is as it seems. What happens when the good versus evil is not what you thought it was and the fae you had been taught to fear were not necessarily the evil they had been made out to be. Humans versus Fae turns into life and love versus greed and death in this epic tale. 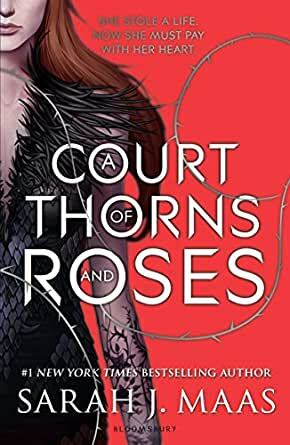 For those that prefer to not enter into a long trilogy, A Court of Thorns and Roses could be read as a standalone novel, however could not wait to get into the second book in this great series. Wow! Such an amazing read I'm so glad that I can download the next book to continue reading this awesome series asap. I had just finished the Throne of Glass series and wasn't ready to fully leave that world behind so I decided to see what all the fuss about regarding ACOTAR. Now while reading the first few chapters I thought it was boring and honestly Feyre was annoying me. Then it started to get interesting. Lucien and Tamlin, where to start. Lucien I like, there is something about him that seems good but I'm not sure if he is a true friend to Feyre or not yet. I think he could be. Tamlin on the other hand I'm not sure I like. I get that he is who Feyre loves and who she would do anything for, but I don't trust him. Rhysand, my beautiful Rhysand...I think he is hiding a great deal of secrets and I can not wait to see what trouble he causes for Tamlin in the next book. Book one of this much lauded YA Fantasy series is, to put it mildly, an extraordinary reading experience. It must be said, however, that ACOTAR starts off relatively slowly. The reader is introduced to the book’s principal character - Feyre - who is a huntress who kills for her own survival and that of her family. Her father is a broken man. Crippled, both physically, financially, and metaphorically. Her mother died when she was younger. He sisters are two unloving, and facetious twats. Her brothers are something our heroine (and the story) were not blessed with. Fate brings Fayre and a beautiful, fully grown wolf together in the sunlight dappled reaches of the nearby Forest. Destiny steps forth to convince Fayre to kill the wolf. She does so, and her life is never the same again. For the wolf she killed was anything but. Fayre is captured for the kill and punishment is either instant death, or lifelong banishment into the enemy’s kingdom. She chooses the latter to save her family, and this is where the book’s true nature takes form and steals the reader’s heart. For this is where we meet Tamlin, and Lucien. The sworn and hated enemies who aren’t. It is easy to detest them both, but read on, and your feelings toward them will soften. Moments of breathtaking excitement and beauty follow. Chapter after chapter, after chapter, feature cliffhangers and profound plot twists, that quite literally, take your breath away, and make it impossible for the reader to put the book down. A chain of truly stupendous OMG moments leave the reader in tatters when they realise they must put the book down eventually to rejoin society. Chapter thirteen is where the book finds it’s street cred from a fantasy perspective. And chapter eighteen is a good way for the reader to determine if they are still human, and if they still have a heart than can be broken. This book is structured, and written beautifully. Pacing is perfect, too. A harsh critic would give it four stars and say, 'its only book one of a trilogy, and you need to leave room for improvement...’ Well, I ain’t no harsh critic. This book is worth full marks, and if the rest are even better, then no doubt the world will get to hear of it. ACOTAR is the first Sarah J Maas book that i have picked up and it is truly gorgeous in just about every way imaginable. My good fortune lies in the fact that book two is less than three months away. That gives me time to read this one again (and again, and again) in readiness, or go and purchase the other titles in her world wide best selling catalog. Either way, I can’t lose. It’s a prickly problem that I am delighted to find myself in a quandary over. 5.0 out of 5 starsRead one, hooked for life. The beginning of a life changing series, if you are debating buying the whole series, do it. You will want all three books with you, the series grabs hold of you and doesn't let go until the very last page, all of the characters have excellent development, there are so many subplots and scenes that will completely blindside you, things that shouldn't be possible and emotion charged chapters that will leave you in a puddle of tears. An extremely gripping tale, and the start to a series that will become a favourite of many, Sarah j. Maas is a writer of epic adventure that will change your pre-conceptions of everything to do with Fairies. I have not been able to find a book to stick with for the past few months. This book, I found on the top 100 book list from other readers. Initially I thought that I may discard it, but after reading for a short time..I found it to be engrossing and enjoyable. The first instalment to this series does not disappoint. A great entry to getting to know the charachters and a well rounded and thought out new world. Absolutely loved it. 2.0 out of 5 starsA guilty pleasure read, but badly written. A Court of Thorns and Roses is the first book in Sarah J. Maas' series. Despite being badly written, it's basically cocaine but for female young adult readers; a guilty pleasure read.